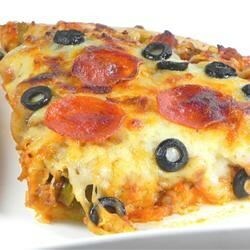 "This is a very filling pizza that my husband loves. My mom and dad use to make it when I was young, and it was always a treat." Heat the oil in a skillet over medium heat, and saute the pepperoni and bacon until evenly browned. Mix in the mushrooms, onion, and green pepper. Cook and stir about 5 minutes, until tender. In a medium saucepan over medium heat, mix the ingredients from the skillet with the tomato sauce and beer. Season with garlic, oregano, thyme, and salt. Allow the mixture to simmer for about 15 minutes, until slightly thickened. Spread over the 2 pizza crusts, and top with cheese. Bake 20 to 25 minutes in the preheated oven, until the cheese is melted and the crust is golden brown. This makes excellent sauce! I used Jay's Signature Pizza Crust. My husband has never said he likes *any* pizza but he liked this. This recipe was pretty darn good but I ended up drinking the whole darn six pack while the pizza was cooking...JEEPERS! Good though. My family absolutely loved this pizza. My husband thought it was the best pizza I have ever made. I wouldn't change a thing. loved it!!! this is a keeper!! !